Our craft, working with brushwood, is not a very common or well known one. This text aims to provide a bit more background. Traditionally brushwood is harvested from `grienden’: an area, often tidal, in which mainly (pollard) willow and alder dominate the flora. Their branches were harvested manually and collected in bundles. In recent times plantations have been developed to grow the wood on, allowing for much more efficient mechanical harvesting, more control and easier maintenance. 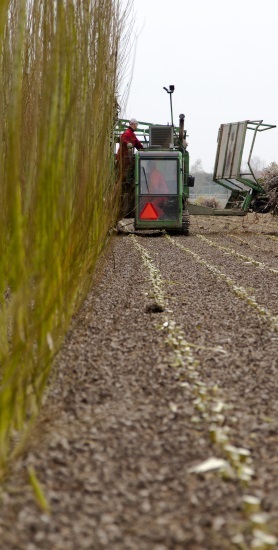 Manual harvesting is still done, for the cultivation of existing `grienden’ but also in plantations to select rootstocks for instance. thinker and more robust than the version based on geotextile. In both cases the production of the mattresses is manual labour. Normally part of or even the whole fascine mattress will need to rest against the shore under water. In order to bring them to their final location, the mattress is first floated into position. This typically happens by attaching the head of the mattress to a `zinkbalk’, and attaching this `zinkblak’ in turn to a tug possibly aided by one or more pontoons. Once in position, the `zinkbalk’ is gradually lowered to hit the bottom. At this point the head of the mattress is already in place. By depositing loads of basalt on top of the mattress, working from head to tail, it is sunk and fixed in place for many decades to come.